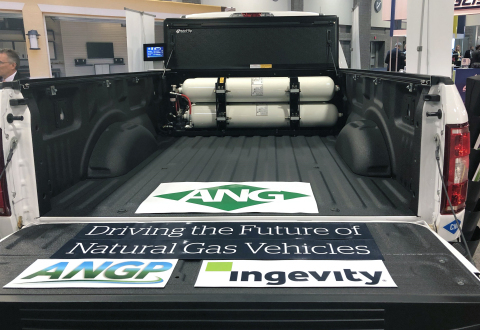 Ingevity and coalition partner Adsorbed Natural Gas Products, Inc. (ANGP), are displaying an adsorbed natural gas (ANG)-fueled vehicle at the World Gas Conference in Washington, D.C., today. This first-of-its-kind truck is built on a 2018 Ford F-150 platform and is a key step in the commercialization of low-pressure ANG technology. ANG technology recently won the 2018 World Gas Conference’s Innovation Award in the “Transportation Driven by Natural Gas” category. Made of a lightweight aluminum, the ANG storage cylinders are located in the bed of the truck and contain Ingevity’s Nuchar® FuelSorb™ carbon monoliths, which allow for low-pressure onboard ANG fuel storage. This bi-fuel truck is the coalition’s third iteration of an ANG-fueled vehicle, whose features significantly increase cargo space in the truck bed compared to previous versions. Ingevity provides specialty chemicals and high-performance carbon materials and technologies that purify, protect and enhance the world around us. Through a team of talented and experienced people, Ingevity develops, manufactures and brings to market products and processes that help customers solve complex problems. These products are used in a variety of demanding applications, including asphalt paving, oil exploration and production, agrochemicals, adhesives, lubricants, publication inks and automotive components that reduce gasoline vapor emissions. Headquartered in North Charleston, South Carolina, Ingevity operates from 25 locations around the world and employs approximately 1,600 people. The company is traded on the New York Stock Exchange (NYSE: NGVT). For more information visit www.ingevity.com.